Git is the most powerful and conceptually elegant source code management system I've used. (Perhaps Mercurial rivals it? I haven't used Mercurial.) But it seems to be in a state of arrested development. Many commands commonly used in ordinary development are basically unimplemented, and have to be performed with a set of lower-level commands. For example, publishing a local branch so remote developers can use it, and then setting up the branch so the remote copy continues to get updates, is a hard-to-memorize set of 3 commands, whereas it's a no-brainer in Subversion. It's as if we had reverted to programming in C. The newfound power is liberating, but it comes at a price. Whereas I have learned all previous SCMs casually (CVS, SVN, Perforce), learning git is like learning C. You won't just pick it up. I've used it professionally for 4 years and I still flounder occasionally. To use it well, you have to understand it. You probably have to read a book. 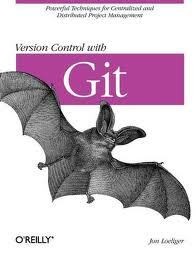 Version Control with Git, by Jon Loeliger from 2009, is a good remedy. It introduces the reader to git's object model (objects, trees, commits, refs, tags), and shows how git's everyday commands use its "plumbing" commands to manipulate these basic materials. The book walks through detailed examples, including some pathologically-complex merges, and describes distributed development thoroughly. If I have a nit to pick, it's that the book's discussion of distributed development is obsolete. In 2009, it may have been appropriate to spend a long chapter discussing how to email patches, and how to apply patches from an email. But these days, GitHub has obviated this process. In my experience, open-source developers, who need to review each other's changes before applying them, use GitHub pull requests instead of git's commands for managing patches over email. I hope a new edition will drastically cut the section on patches and add a discussion of GitHub's collaborative features. If you're not ready to read a whole book, "Git from the bottom up" by John Wiegley provides some of the core concepts. ← Review of Seamus Heaney's translation of "Beowulf"